SAN DIEGO -- Gov. 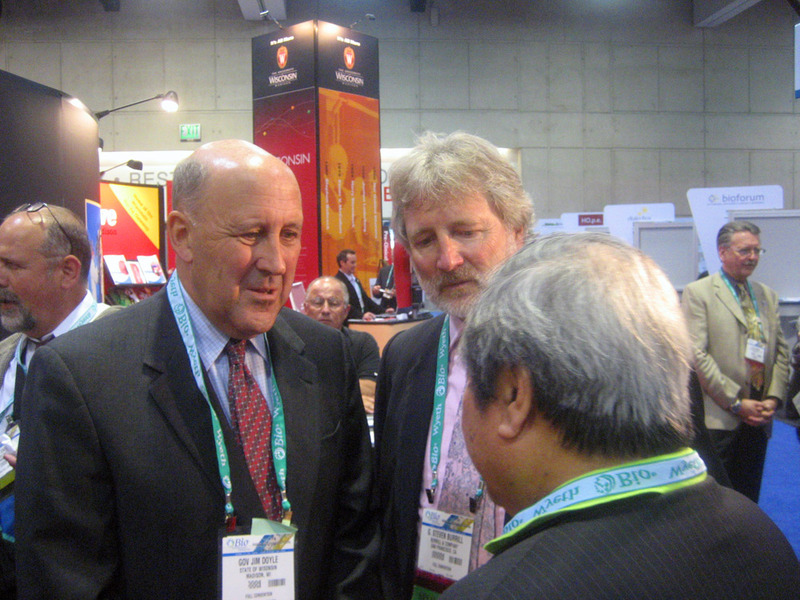 Jim Doyle issued an informal challenge to California Gov. Arnold Schwarzenneger to come to Madison in September to attend the World Stem Cell Summit so he can see for himself the center of stem cell research. Gov. Doyle, speaking to a crowd on the floor of BIO, dismissed Schwarzenneger's boast earlier in the day before more than 1,000 representatives of the biotechnology industry that California was the nation's leader in stem cell research. Doyle's invitation landed at the end of what he said was a day of "very substantive meetings'' with a number of major companies looking to invest in Wisconsin. At the same time, he cautioned, success can't truly be measured until deals actually happen. "It's a competitive world out there,'' Fischer said. Speaking on the convention floor, Doyle repeated his pledge that his goal as governor is to help guide Wisconsin to capture 10 percent of the nation's stem cell market by 2015. "Wisconsin has the best and brightest researches and some of the most significant discoveries,'' he told a crowd that gathered at the Wisconsin pavilion. "We're going to build our economy by helping people improve their lives. Bioscience is the fastest growing field in our state economy right now." -- The Wisconsin Institutes for Discovery was launched and construction begun on the $150 million research center that will combine two institutes -- one private and one belonging to UW-Madison -- in a collaborative scientific research effort that includes science ranging from nanotechnology to new human medicines. -- The $135 million Great Lakes Bio Energy Center was awarded to UW-Madison, the first new federal laboratory in a century. The new center combines the efforts of researchers in five states to research and develop new ways to make fuel from plant matter. -- Dr. Jamie Thomson, who isolated the first stem cells used for research from discarded fertilized eggs, discovered a way to develop similar stem cells by converting skin cells to cells that look and act like stem cells that can be used for research. -- The number of biotechnology companies in Wisconsin topped 400, adding $8.6 billion to Wisconsin's economy as well as 34,000 jobs. "We're going to continue to do this the Wisconsin way -- not by making claims we can't back up, but by doing ground breaking research and bringing it to the marketplace,'' Doyle promised. Doyle was joined in his speech by Steven Burrill, a Wisconsin native whose Burrill & Co. in San Francisco is one of the nation's top biotechnology companies. Burrill was blunt -- and extremely positive about Wisconsin, where he still owns a home. "We have a $1 billion in venture capital to invest in biotechnology companies, and we would put every dime of it in Wisconsin if the opportunities were there,'' Burrill said. "Wisconsin's venture capital investment climate has improved dramatically, your entrepreneurial climate is strong, and you are the home of one of the intellectual centers of the world," Burrill said. Wisconsin Governor Jim Doyle is joined by, Wisconsin native, Steven Burrill of Burrill & Co. at the Wisconsin pavillion at the 2008 BIO International Convention.